NASA researchers will be observing what happens when the moon's surface cools quickly during the total lunar eclipse on Wednesday. A full moon in a clear night sky is nothing short of breathtaking. But, the next one will be even better, for three reasons. Early on Wednesday morning, much of the world will get to see the lunar trifecta, if you will: a blue moon, a supermoon and a total lunar eclipse, all in one. This hasn’t happened since 1982 and won’t again until 2037. North Texas will have clear skies and favorable conditions for viewing the rare event, the National Weather Service in Fort Worth says. 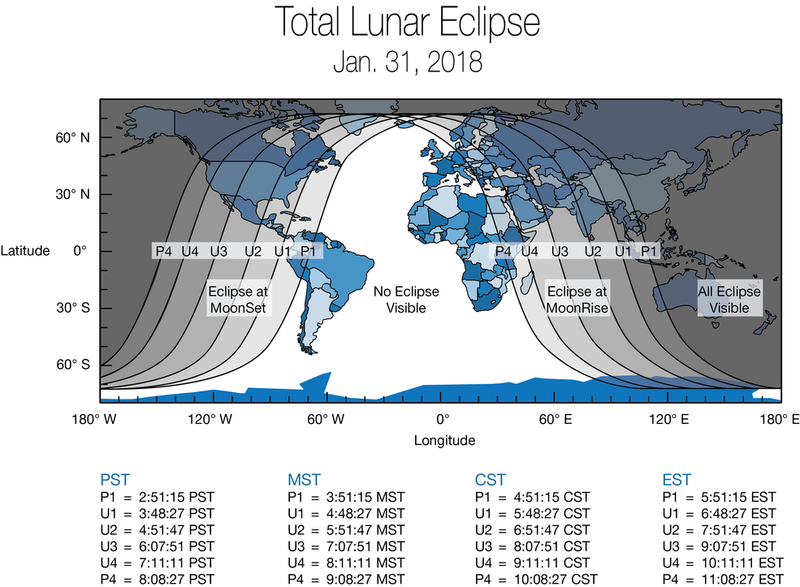 The total lunar eclipse will begin at 6:51 a.m. Here’s how it will play out locally, according to timeanddate.com. Here’s how it will play out across the globe by NASA’s calculations. NASA plans to provide a livestream of the moon from telescopes in California and Arizona, beginning at 4:30 a.m. If you miss it, you’ll have to wait almost another year for the next opportunity in North America, according to NASA. The Jan. 21, 2019 lunar eclipse will be visible throughout all of the U.S. and will be a supermoon, but not a blue moon.